Big Mac Boxers – For work, play, or show! Big Mac Boxers Where Quality, Health, Type, & Temperament Meet! Big Mac Boxers Specialize in Exquisite Type, Top Quality, Health Tested, European Boxers. Our dogs come from outstanding working & conformation lineages from Europe. These pedigrees produces a wonderful headpiece, large square bone structure, excellent temperament, along with natural working/protection capabilities. I pay close attention to dominant and recessive gene traits for this is needed to fix a lot of health concerns in the breed. It is true that Boxers have more than their share of health concerns, and while it may be impossible to completely remove them from the breed altogether, I do my best as a Breeder, to try and adhere and lesson the affects through breeding health tested European dogs from quality old world lineages that have shown there longevity & health throughout there pedigree. That is not to say that I wouldn’t like to see significant improvement in the breed (along with my breeding program) over the next 10 years…My main priority and concern is to focus on healthy hearts and longevity! I prefer to breed dogs closer to the FCI standard (European) as opposed to the American type for I adore more bone, working abilities/personalities, along with “outstanding head piece” so i only have German Pedigrees. All of our adult dogs have a echo-cardiogram and holter (EKG) test performed with clear/normal limits. Other testing we also perform is Thyroid T1 T2 T3 & T4 along with full blood panels, Hips, DM, OFA Patella & DNA Certification. Our imported boxers are from quality Old World, Reputable Kennels in Germany, Italy, Hungary, & Spain. We feel this is where the finest dogs are produced and have been since the origination of the breed. Our puppies are bred with great attention to the genotype, phenotype, temperament, along with the health of the parents, grandparents, including the rest of their entire family tree. Breeding selections are carefully made to produce the complete package that have the genetic foundation of proper conformation, working ability, along with outstanding health & longevity! The breed standard (AKC &/or FCI) states that all boxers must have proper proportions. Our dogs all have that beautiful square body, nicely turned up snub nose, along with amazing trophy head. Our German (FCI) breeding endeavors emphasize size, bone structure, and make a more muscular well-defined boxer that has superior intelligence, ultimate on/off working drive, & correct temperament desired in the breed. Our females weigh from 65 to 85 lbs. and males from 80 to 95 lbs. You cannot find a more loyal, devoted, and affectionate family member! Exquisite Type, Top Quality, Health Tested, European Boxers. 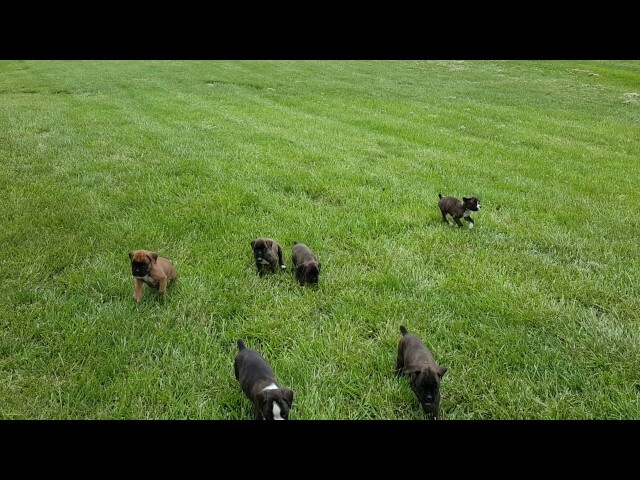 Big Mac Boxers ~ Where Quality, Health, Type, & Temperament Meet! It’s not my breed, It’s my passion! © Copyright | Big Mac Boxers: All content within website is not to be copied, or reproduced without WRITTEN consent.